We ring in the New Year with the introduction of some great new power supplies courtesy of Enermax. Enermax has always had a wide selection products ranging from mid- to high-end PSUs in a variety of wattages. Enermax is mostly active in the retail market so they've always had a good idea about how to design products that appeal to end-users. They have maintained a stable business in the retail market, especially in Germany. It comes as little surprise that Enermax was one of the fastest companies to introduce high efficiency power supplies to the market, with a lot of new features. That trend continues with their new 87+ series. A little while ago Enermax introduced the Modu82+ and Pro82+ and we tested a total of four units. We thought it would be nice to continue with this trend and introduce all of the Modu87+ and Pro87+ series power supplies Enermax released this month. There is one feature on these new power supplies that helps them stand out in a crowded market: they are 80 Plus Gold certified. 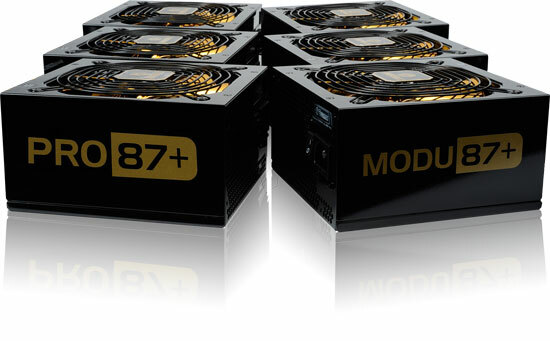 This alone doesn't make them unique as we already have many other 80 Plus Gold power supplies, but the Modu87+ and Pro87+ series both come with a starting wattage of 500W, making them far more interesting for a large number of end-users. Realistically, few systems really need a power supply that can output more than 500W, and getting a very high efficiency at common power draws is a bonus. Fortunately efficiency isn't the only noteworthy feature on these power supplies, but high efficiencies can only be reached with certain technologies. These technologies alone will make an overall better product out of a higher ranking 80 Plus certified power supply. Both series are now available in three versions: of 500W, 600W, and 700W. There will be two more models rated at 800W and 900W in Q2 of this year. The good news is that the units we are introducing today have already been shipped and the first units should be on US shelves now or in the near future (we were unable to find any online as we publish this article). Enermax told us that there should also be some mail-in rebates and other incentives available to make these new power supplies even more attractive. To be brutally honest here, I would be very surprised to find more than one person in the pool of hardware geeks that are my friends that has a computer that, even under load, consumes more than 300W. Even really powerful gaming machines (say, core i7 + HD5870) usually draws around about 100W idle, and with recent developments usually even less than 80W (yes, really). Under load, these machines barely top 200W. You would need to do some serious skulltrailing to build something that needs 400 or 500W. For the serious gamer, a 350W PSU should be the norm - why you ask me? At idle, a single-processor, single-gpu machine uses about 20% of the PSU's rating, and that is where the serious efficiency benefit is for forward converter topologies. Right now, gamers use ridiculous 500+ W power supplies which leaves the PSU uselessly wasting energy at idle, where the computer is most of the time anyway. I'll agree with you to an extent. The 700+ PSU's are more than overkill for most people. But keep in mind the longevity of the PSU. Most people do not like their PSU's running 80% of capacity when under load, and I constantly hear 60% as the sweet spot for long-life. We are now approaching a sort of saturation point for PSU efficiency so I don't see people buying a new PSU every single time they upgrade or rebuild. It was different when we were jumping from 50-60-70% efficiency. But going from 80-82-84-etc is not really that big (from both a utility cost and heat standpoint). These new PSU's are great in that they get very high efficiencies at anything pretty much above 20%. Other brands are also almost there (25-30%), so it's kind of moot. You're not going to see large price differences if they made 350 or 400w because the main cost is in design and manufacturing, not so much the difference between parts (some but not the bulk of the cost). "Enermax posted this video on YouTube to show real life experiences and how they could be solved with CordGuard. We think it's dangerous to let kids play behind a PC in the first place, and let's just hope they don't notice the power switch…." Or do one of the more creative/inventive things kids have been known to do. Like perhaps try to stuff a peanut butter and jelly sandwich through the fan grill . . . But right, I do not think any responsible parent is going to let their young kids play around with the power supply of a computer in the first place. I would think Enermax needs to work on their marketing a bit more . . . The video stinks, and screams "skiddy". CordGuard is not a terrible idea, but come on. Are they really trying to market a $.05 gimmick ? When did the name Enermax sink so low ?